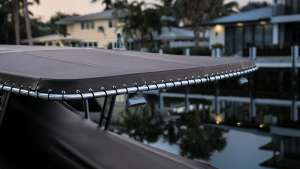 HarborTime® Edge is a heavy-duty boat fabric featuring Perfecta Marine® technology for superior heat reduction and reflection. Made from acrylic-coated polyester with exceptional abrasion resistance, this marine fabric is well suited for harsh weather conditions. HarborTime Edge is tested for minimal shrinkage and stretch while remaining highly mildew, UV, and water repellent. This product can be used for splash curtains, T-tops, bimini covers, upholstery, mooring, travel covers, and more. For more information on HarborTime Edge, please visit trivantage.com, or contact your Trivantage® customer service representative.